Want an accurate scientifically valid assessment on your personality? Want to truly discover the appealing and commendable character traits which define you? Need to locate those astounding personality traits that separate you from the bunch? With our new, innovative, and unforgettable DISC Talk for the World, you have this ability to find greater meaning and value within yourself. 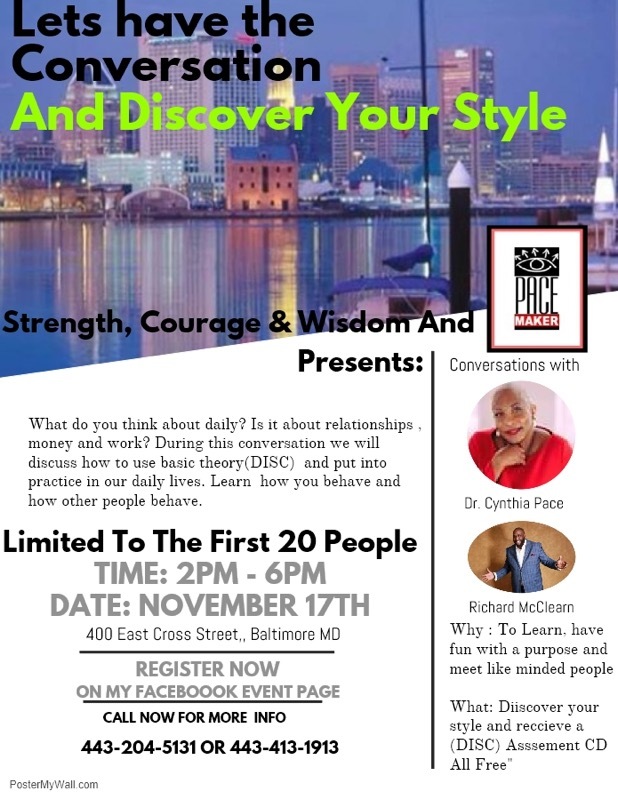 With DISC Talk for the World, you will realize your potential and receive a full, accurate account of your character traits. We are able to upload this into your professional life instantly. DISC Talk for the World catapults you to a level of prosperity and unprecedented understanding. It is time to stop resting on your laurels and struggling to find what is right …You possess the right elements and mental make-up… Now, it’s time to capitalize on your capabilities! With PACEMAKER, you have the freedom to reinvent the power of DISC. Pacemaker enforces the power of DISC to the world in an engaging, memorable, and sustainable way. Try a new way of memorizing and understanding what makes you tick, discover authenticity behind why you do what you do. This is the perfect solution for someone who is undergoing a self-revelation, switching careers, or truly looking to elevate themselves personally and professionally ascending from better to best! This is a necessity for all professionals looking to better aspects of themselves and their career paths. We target the likes of trainers, teachers, therapists, career coaches, counselors, managers, human capital managers, and myriad others from across all professional fields. There are no limitations on who and who cannot attend. We implore anyone searching for self awareness and greater value to DiSCover the greater good and capabilities within them! Tittle: What is Your Style?